If you haven’t read The Hunger Games trilogy but plan to, you may wish to skip over this post. But if you’ve already read through book two, or don’t mind reading it after a spoiler, then come along. I think you’ll find this interesting. 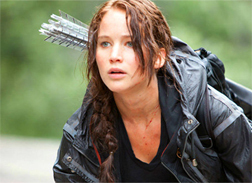 The Hunger Games is a young adult series set in the territory of a post-United States. A dictatorial government has taken control, and one of its severest forms of suppression is to choose through a lottery each year a group of adolescents who must fight to the death in a televised arena. One winner emerges victorious and is provided with a house and a lifetime supply of food for them and their family. It’s a bit of Shirley Jackson’s “The Lottery,” Roman gladiators, and Survivor reality t.v. all rolled into one. Katniss knows who the real enemy is, alright. It isn’t the people in the arena with her; it’s the governmental powers who put them there in the first place. In the heat of the arena, however, it isn’t always easy to focus on the real enemy when a much more pressing enemy is at hand. Towards the end of the book, Katniss is watching another player stalk her through the trees. She has her bow and arrow cocked and aimed at him when she suddenly remembers her mentor’s words. Even though this person moves towards her with every intent to kill her, he is not the real enemy. Fighting him, in fact, just plays into the real enemy’s game. She pivots her arrow away and fires it instead at a weakness in the arena wall. We may never find ourselves physically staring down an arrow at another person, but how often do we point our mental arrows at those around us? How often is he to blame or is she at fault? We are not so unlike the players in the hunger games. We are thrown, every one of us, into this arena known as life. From the minor inconveniences to the major calamities – shootings, genocide, war, famine – the immediate enemy may be in the arena with us, but the real Enemy is much more insidious. Be sober-minded; be watchful. Your adversary the devil prowls around like a roaring lion, seeking someone to devour. Resist him, firm in your faith, knowing that the same kinds of suffering are being experienced by your brotherhood throughout the world (1 Peter 5:8). The devil loves nothing more than to pitch us against each other. But we must be sober-minded. We must remember who the real Enemy is. We are, in fact, all in this together. And just like the weakness discovered in the arena wall of the hunger games, there is a weakness in our Enemy. The barrier that separates us from God is a bit like that televised arena. We look around and see only ourselves, but on the other side of the barrier, God is watching us. We cannot reach through the barrier to Him, but He can – and did – come to us. After you have suffered a little while, the God of all grace, who has called you to his eternal glory in Christ, will himself restore, confirm, strengthen and establish you (1 Peter 5:10). Like the helicopter that rushed through the weakened arena wall to scoop Katniss from the ground, so our Savior rushes through the weakness in life’s barrier to scoop us into His arms. Jesus Christ destroyed, once and for all, the power of the devil. Satan may still prowl around like a roaring lion, but we can resist him, firm in our faith, when we remember that God himself will restore, confirm, strengthen, and establish us. We can resist him when we turn from our internal fighting… when we remember who the real enemy is.